American ninja movies got their start in the early '80s. Films like The Octagon starring Chuck Norris in 1980 and Enter the Ninja in 1981 brought the Japanese genre into American mainstream. The tradition continues through the present day with even kid-friendly films like The Lego Ninjago Movie which is set to hit theaters this week. Our affiliate friends at HalloweenCostumes.com have put together a comprehensive infographic highlighting over 50 American films featuring ninjas over the past 37 years. You'll see '80s cult classics like American Ninja and Miami Connection to mainstream favorites like the Teenage Mutant Ninja Turtle films. 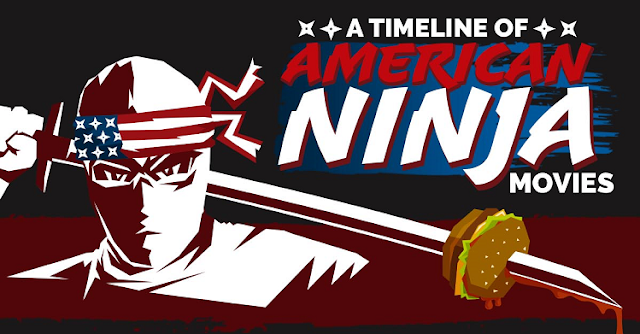 View the infographic below and leave a comment with your favorite American ninja film. Also make sure you visit HalloweenCostumes.com this season for the best selection of costumes featuring '80s characters. More details to come on brand new costumes for 2017 and a chance to win a $50 gift card!